(c) Temporarily install the front seat assembly with the 4 bolts. 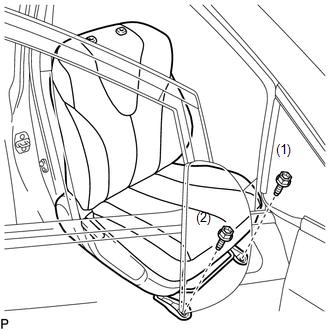 (d) Lift up the seat track adjusting handle and move the front seat assembly to the rearmost position. (e) Tighten the 2 bolts on front side of the front seat assembly. Tighten the bolts in the order indicated in the illustration. (f) Lift up the seat track adjusting handle and move the front seat assembly to the foremost position. (g) Tighten the 2 bolts on rear side of the front seat assembly. 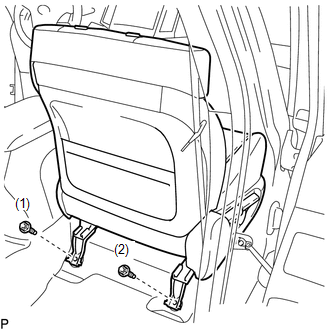 (a) During sliding operation of the front seat assembly, check that the left and right seat adjusters move together smoothly and lock simultaneously. If the seat adjusters do not lock simultaneously, loosen the bolts securing the front seat assembly to adjust the seat adjuster position.